Home Festival Wishes Bestest Collection Of Quotes For Wishing " Happy Deepawali "
Bestest Collection Of Quotes For Wishing " Happy Deepawali "
Deepawali is a most popular festival in India, celebrated every year by the people of Hindu religion with great enthusiasm. The significance of celebrating this festival is to celebrate the returning of Lord Ram, Sita and Lakshman to Ayodhya after 14 years of exile as well as birth of Goddess Lakshmi from the churning ocean. We worship goddess Lakshmi and God Ganesha to get prosperous and wealthy life and wisdom. 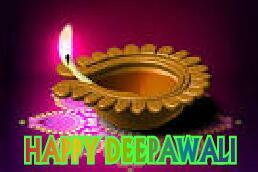 On the night of Diwali, we lit diays for whole night to welcome the goddess and get blessings for whole year. All the family members get together at one place, do worship and pray to goddess. We clean, white wash and decorate our house to make it more beautiful and dazzling. In the night after puja, we get involved in lighting the lamps and fire crackers. Whole environment becomes full of high pitch noise and smokes of the firecrackers . So everyone please find time to wish " Happy Deepawali " to your family , friends and your relatives and celebrate the brightfull and joyfull festival with your full of joy . Creat the surrounding of happiness and say bye - bye to sadness . A VERY SPARKLING DEEPAWALI !!!!!! Have a Happy Diwali 2017 to you and your family. !!!!!!! Wish you a safe Diwali !!!!! !